Hooray for Comics: Late Night Double Feature! Well it is officially 12:01AM on December 1st! NaGraNoWriMo is over! OR IS IT?! 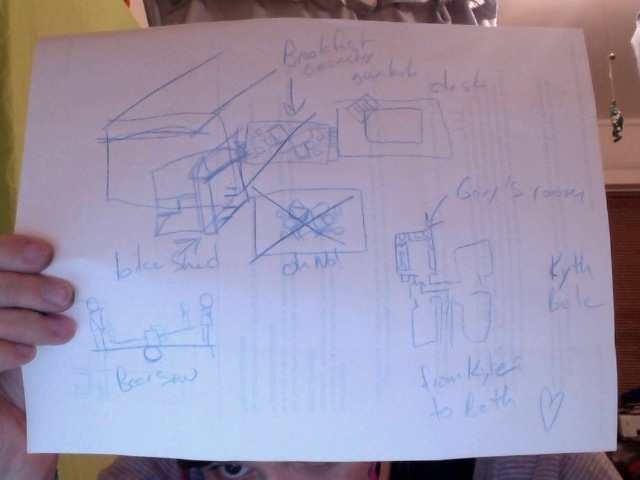 As promised here is an honest to god update of Kyle and my book, Cycles. 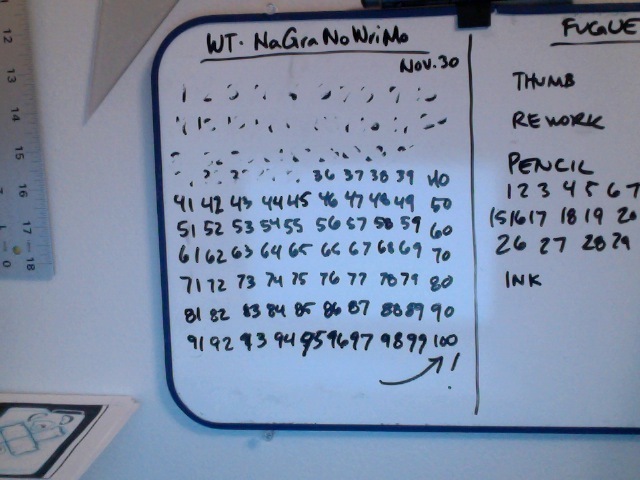 Here is my dry erase tally of how many pages we were shooting for. 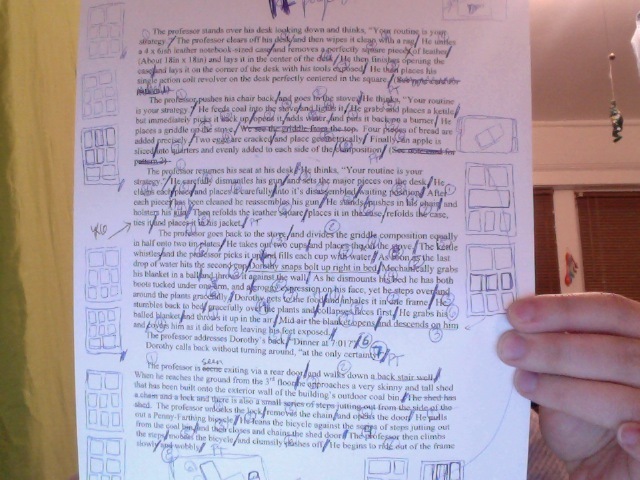 I dragged my finger through each page I finished. Yes ladies and Gents this says only to page 36. 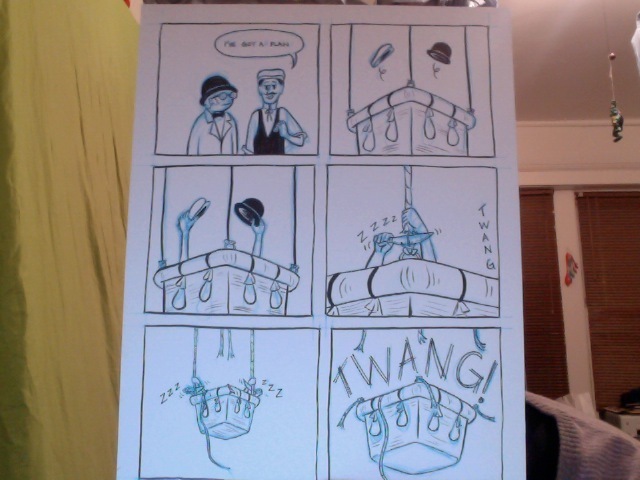 However I penciled through to page 44, but just couldn't ink fast enough today. Ah well. 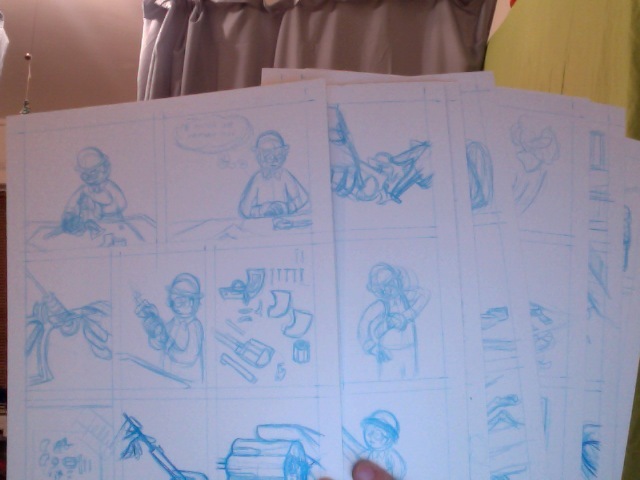 Penciling 6 pages, and inking 3 in one day isn't exactly small potatoes. Next up is a little process stuff for all you curious folks at home. Ideal how this was going to work was Kyle would take allof October to write me a script. Then on Nov. 1st he hands it over to me, and he doesn't see anything until I put the pen down at 12:00am Dec. 1st. Then we edit, then we share with the world! But the actual factual way Kyle and I did this was he would spend some time and write a scene at a time and email it to me. I would get a big old chunk of text with some descriptions, a lot of dialogue and occasionally editorials from him. I would pull out my favorite ball point pen and start marking what was a panel, what was a beat, and the page layout for that scene. This process would usually take me under 20 minutes per typed page. This was the most recent chunk of text that he gave me on Monday night. Then I'd grab my favorite dance album, or listen to my favorite two podcasts (Kevvie Metal and Nerds for Reel) and pencil till my hands, and pages, turned blue! I've been averaging about 45min or less a page. In case you can't tell, my penciling technique is "draw a hundred lines and you'll find the right one eventually!" 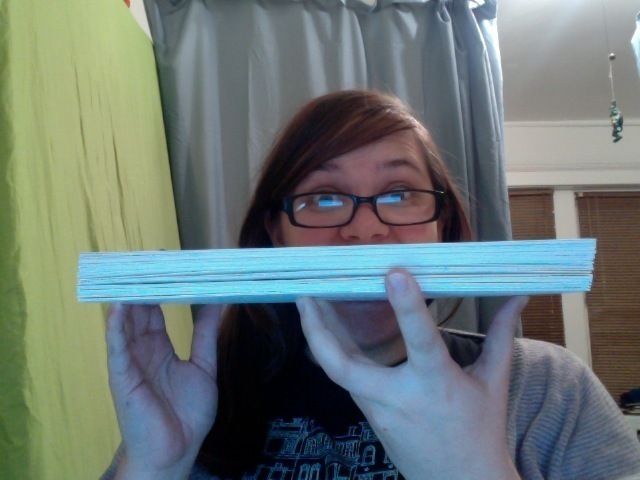 These are the remaining 7 pages to ink, I penciled all but one of these today. This is also the phase during which I find photo reference for things Kyle may have written about or specified that I don't know what they look like. 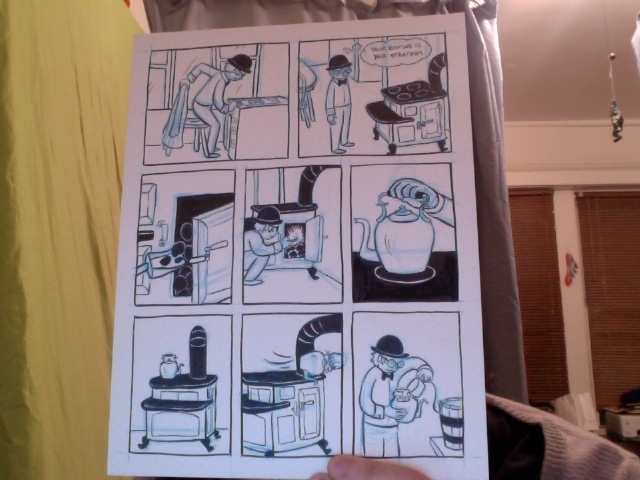 Here's my most recent print out for something yet to come! 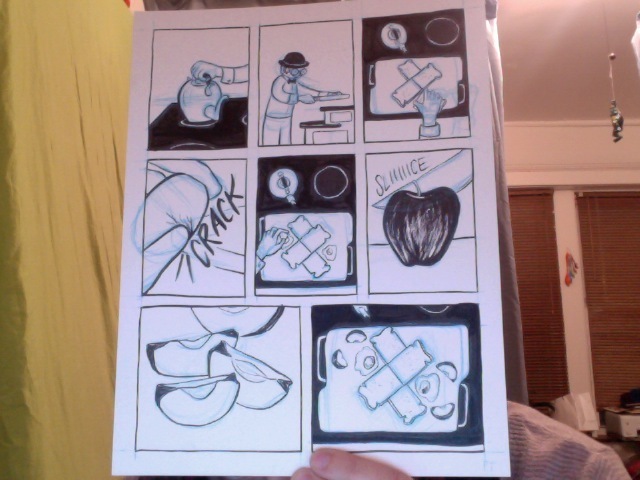 And lastly is some inking. But hey, you all know how that goes! I've been inking with my Pentel Pocket Brush and lettering with a Faber-Castell F grade Pitt Pen. But spotting blacks with my favorite number 2 synthetic Utrecht brush. Without further adieu, thank you everyone for rooting for me. It definitely was a challenge and Kyle and I WILL be finishing this book! 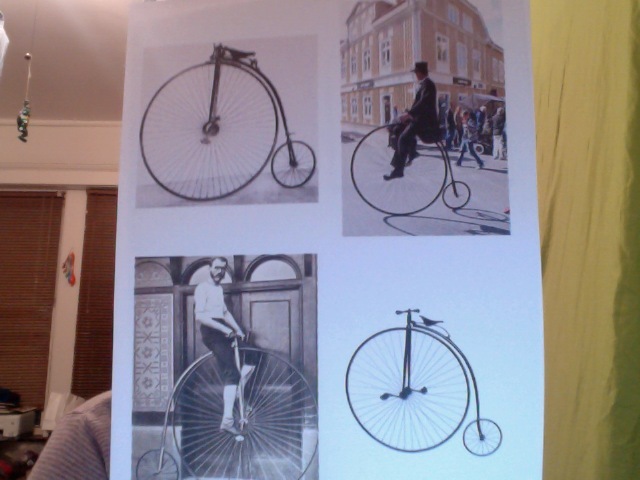 Keep your eyes peeled for it in print in early 2012. Enjoy some fun pages and the last page I inked in November 2011. NOT IN SEQUENCE WITH THE NEXT TWO. Dude, this is looking super sweet. Congrats on all the hard work!! Yeaaaah, Beth! Those pages look great. 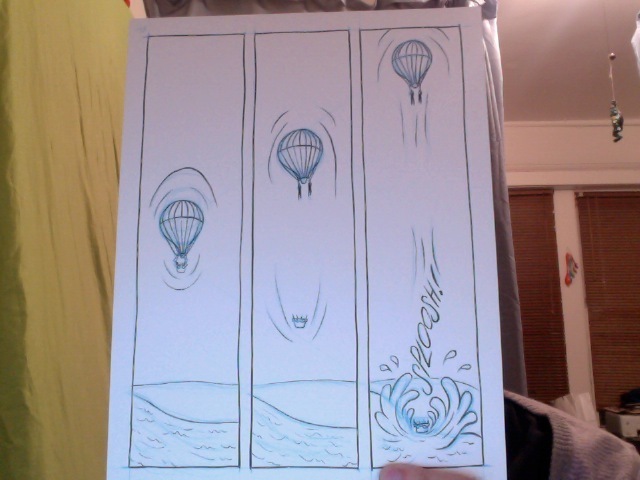 I am especially excited about that balloon page. BALLOONS. Holy cow, what a massive amount of work! And it all looks totally cool--well done, Wonder Twins! One question: how is that Alison is posting in the future? The timestamp on her comment says, "December 1,7:44 AM," but it is currently only 7:08 AM, December 1........is she a time traveler???? Reading this post, you definitely put a LOT more work into your NaGraNoWriMo project. Photo reference? Multiple tools? Girl, you a champion! I love seeing how the art progresses. Neat post!